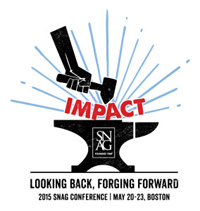 In early 2015 I decided I would treat myself to the 3.5 day SNAG conference in Boston, May 20-23rd, my first time attending this event. I immediately booked an airbnb apartment in a great area of the city (behind the Boston Pops venue) for the entire week, so I had a few days to explore the city, go museum hoping, and visit the parks and cafes before the conference started. I found it to be exhilarating, informative and very useful in terms of gathering information, learning new things, meeting other like-minded jewelers and networking. There was a full schedule of events from early morning to evening every day, including an opening keynote presentation by Ruudt Peters, a meet-and-greet including pin swap, opening party, vendor room, silent auctions, raffles, small scale discussions, larger scale presentations, demos, exhibitions, professional development seminars, voting for 3 new board members (and getting a sterling anvil brooch as an incentive to vote), trunk shows and an Exhibition Crawl whereby shows were set up around the city in galleries, art centers, schools and museums. And of course there was always the informal opportunities to sit at the bar and strike up a conversation with one of the attendees. The presenters were varied in terms of their oeuvre, working methods, markets, contexts et. al so there was a quite a range of perspectives. I enjoyed Mary Lee Hu’s presentation on her work and her message that art jewelers have a unique heritage and history that is being ignored in academia as it isn’t considered a legitimate art form. Her call to action was for all of us to demand that programs in schools and universities correct this omission in their curricula. I also attended a talk by Boris Bally who uses discarded traffic signs to create functional pieces like chairs and tables and wearable art. He described a Summer residency he had in Derry, North Ireland last summer where he taught, organized a student exhibition and completed a permanent installation of public art for Derry. There were other good presentations but not enough space here to describe them all. For me there were three high points from the conference. First, I signed up for a “portfolio review” and I was given the opportunity to have my work reviewed by two different artists including Kristin Beeler, professor of art at Long Beach City College, LA and Boris Bally. The sessions were informal and unstructured 20 minute sit-downs where you could ask questions, get feedback, and generally discuss any aspect of your work that you needed to. Both of these artists gave me incredibly useful things to think about and made me look at my pieces in ways that I hadn’t thought about. It was the impetus I needed to go forward in my work and a rare opportunity to have one-on-one time with successful people working in the field who lent a critical eye to what I’m producing. You don’t get that very often, but it’s so necessary. The second high point was hanging out in the vendor room, but oh so dangerous. Rio, Allcraft, Otto Frei, GRS, Reactive Metals were all there, as well as diamond and stone dealers, and book seller Charon Kranston, etc. Rio had Phil Poirier and his team demoing the hydraulic press, Billl Fretz with his fab miniature stakes and hammers, Kate Wolf with her wax carving tools, and Jayne Redman selling her system for cutting blanking dies. I’d say the third important aspect of the conference was seeing friends and meeting some new people. I’ve taken several workshops in Boston at Metalwerx over the last year so it was great to see those folks there (Lindsay Minihan the director and Yleana), as well as seeing some of the instructors that I’ve invited to give workshops to WGG over the last several years including Andy Cooperman, and Jayne Redman. It was also fun running into some WGG members there (Beverly Tadeu, Jan Mandel, Lisa Vershbow, Susan Sanders), and some from my Baltimore (MICA) days – congrats to April Wood for her election to the SNAG board. I also got to spend time and get to know some of the SNAG board members including Anne Havel and director Gwynne Rukenbrod Smith. In conclusion, SNAG has just come through some bruising and difficult years where, in order to survive, they needed to get their financial house in order and respond to the needs of the membership in a new way. This year’s conference signified a time when SNAG is just emerging from that turmoil, and though not out of the woods yet, is certainly on a very good footing going forward. I think the board members and planning committees pulled out all the stops for this event and it showed. I’m so thankful that the organization didn’t fold as I think it’s vital that art jewelers have this resource which gives us a voice in the wider world, and a mechanism for professional representation and development. I encourage everyone who can, to attend a SNAG conference. Next year it will be held in Asheville, NC…..a very fun and artsy city.